“Woo hoo! I won!” I exclaimed after I dropped the red coin into the slot. I made four dots to connect, enough to win a game of Connect Four. Meanwhile, my son’s lips quivered, his eyes welled up, and in a matter of seconds, he was in tears. This wasn’t the first time, either. Another day, we were playing Candyland and he pouted when I explained he had to slide a few spots back. “That’s part of the game,” I tried to reassure him. No one likes to lose, but we all do at some point. Even when we feel like we gave it our all. From board games to school competitions, coping with loss is a skill kids should learn. Avoid frustration by explaining the point of the game before you play. Explain the rules and the circumstances that allow a player to win. In Candyland, I could’ve explained that some spots meant moving back several spaces. Knowing the rules before your child starts makes it seem less shocking when she loses. It’ll also remove any sense of unfairness. I realized my mistake the minute I whooped, “Woo hoo!” after winning Connect Four. I celebrated my victory too much, to the point where my son had no choice but to slink in his seat realizing he’d lost. Now I know better than to egg him on after winning. Or to even focus on winning so much. I don’t sugar coat competition, but I now focus on team effort instead. 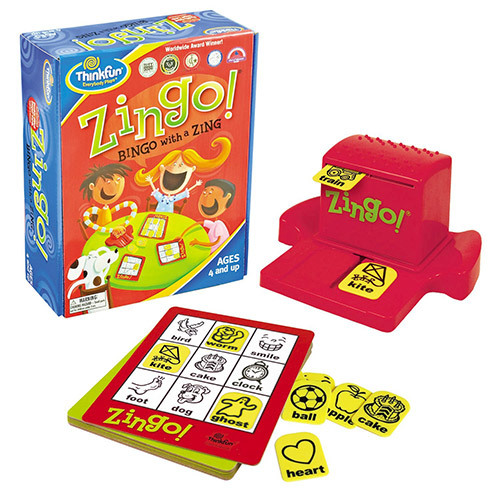 For instance, all three boys have been playing Zingo (think kid-version of Bingo). At some point, one of us will finally fill our card and claim “victory.” Except now we focus on filling everyone’s cards before calling it quits. We wait until we’ve all crossed the finish line. Even if one person was first, everyone gets a chance to finish their card. It’s tempting to save our kids from loss and failure. Often, we let our kids win, especially when we know they have no chance at doing so on their own. Trouble is, this gives them a false notion of playing and competition. The focus shouldn’t be on winning, and you shouldn’t gloat your victories. But allowing your child to lose gives her an even better gift than winning: The ability to cope with disappointment. Saving kids from every struggle won’t shield them from disappointment. By allowing your child to lose, you’re helping her develop grit, perseverance, and strategy. You’re better off showing her new techniques to try, or explaining the rules once again. But don’t allow her to win every game because you don’t want her to feel sad or upset. So, back to focusing less on winning. Imagine that’s the only thing you praise as you’re playing the game. Each step forward on the game board gets applause. The winner gets to boast and dance. Meanwhile, you forget to praise her for other overlooked skills. Games won’t be all about winning because she’ll learn to value other skills as well. Even with all the preparation, your child is still devastated. She may have even launched into a full-blown tantrum and can’t handle losing the game. What to do? 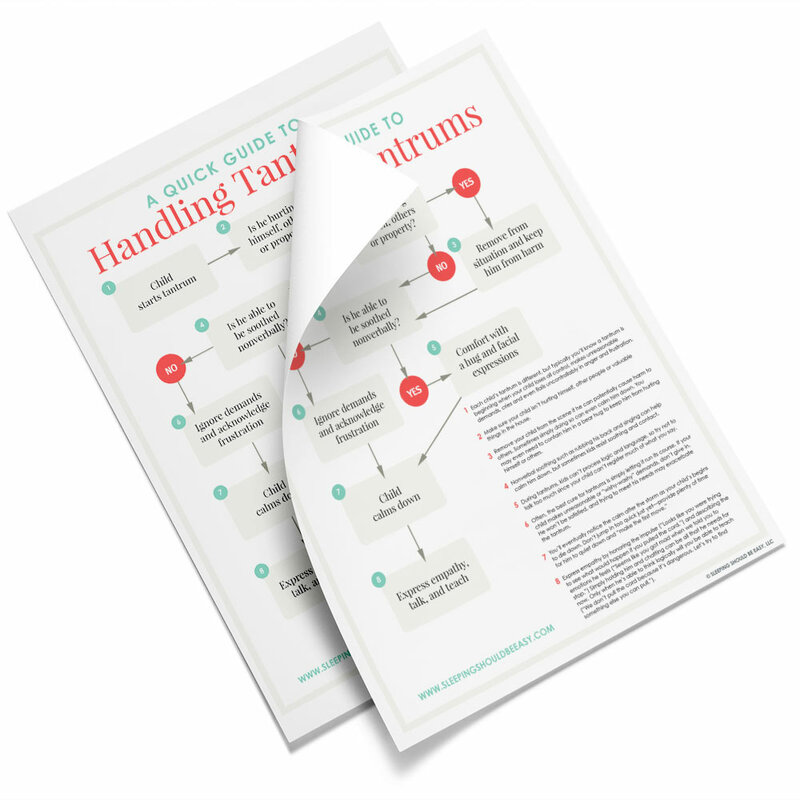 If you’re like me, you may have grumbled to yourself at what a poor sport your child is being. This isn’t what you imagined when you suggested playing a board game. You thought you’d have fun sitting around the coffee table. Instead, your child is in tears because she doesn’t know how to lose gracefully. Before you lose your own temper, remind yourself this is normal. Your child is still coping with the concept of winning and losing. She’s learning how to manage loss and disappointment. She might think the whole thing unfair. And she’s so overwhelmed with emotions, she’s having a hard time listening or communicating. Her behavior, though inappropriate, is still something she’s working on. The more empathetic you can be to her feelings and actions, the quicker her path to managing them better. I’ll admit: I sometimes hesitate playing competitive games with my kids. I’m afraid I’ll have to placate crying kids who can’t seem to handle losing. Still, kids need to learn how to cope with these wild emotions. They need to know it’s okay to lose gracefully, no matter how frustrating. That other skills, like good sportsmanship and effort, are just as worthy as winning a game. And they learn not only how to win with humility but how to lose gracefully. Even when their mom slips the last red coin in the slot and wins the game. Tell me in the comments: When has your child sulked at losing? 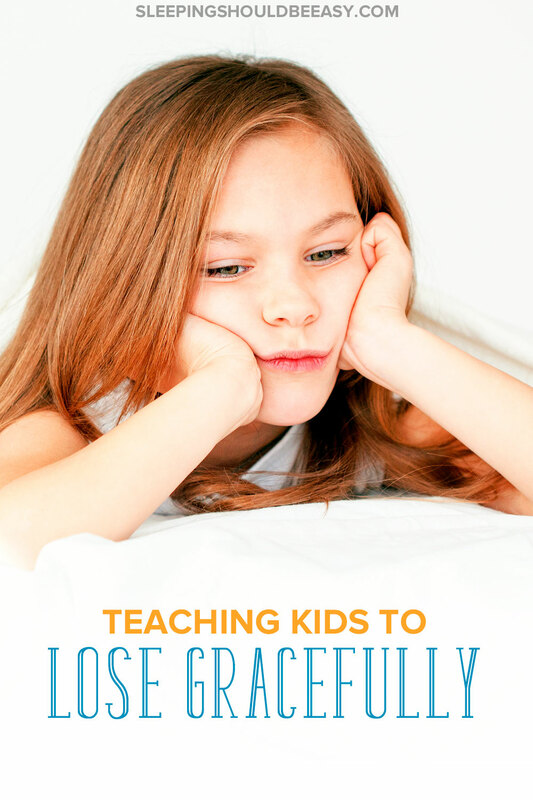 What can we teach kids so they learn to lose gracefully? Hi Nina, an excellent post. Learning to lose gracefully is far more important than winning and is what I focused on when playing games with my two when they were small. Giving praise for losing well is important, that way a child knows they have handled it well and still comes out of the game feeling good. Teaching a child that winning isn’t the be all and end all, but giving it your all and having fun is. Thanks for kind words, Debbie! And right on, looks like you did similar things with your kids! This is very timely! Lately, there were days when my son would come home crying because he lost a running game with his playmates. Truthfully I wasn’t prepared when he said he lost and he was so upset about it. I could only hug him and say it’s okay to lose. And then he would tell me he will eat more so he’d be stronger and faster and win next time. There was also one time when he was about to cry because he lost a game at a kids’ party we went to. I just gave him chocolates after. Sheesh! Aw Rea, that’s cool he came up with his own solution to winning next time (eating to get stronger). You did great to just hold him and acknowledge it’s normal to lose. Knowing that I play a ton of games with my kids, it’s comforting to know I’m mainly doing this all right! I do let them win, and lose, and I do show empathy when they lose, and I’m happy they show it to me when I lose! Sometimes on purpose.. but sometimes not! This is definitely a tough one for kids. In T’s first grade class the kids regularly played board games and game night was even assigned as a homework assignment. The teacher reminded us constantly to let our child lose and to focus on kindness and etiquette. We were all expected to end each game by saying “good game” whether or not we won. I can’t say that T never pouts when she loses, but it’s nice having that external source of support. What a creative way to teach good sportsmanship. I never thought of having game night as an assignment, but you definitely do learn a lot about yourself and others!